El Sharq is back on 12111.00MHz, pol.V SR:27500 FEC:3/4 SID:727 after a break ( PID:1128/1640 - FTA). Nieuwe SID voor El Sharq op 10730.00MHz, pol.H: SID:10901 ( SR:30000 FEC:3/4 PID:911/912 English - FTA). El Sharq is back on 10730.00MHz, pol.H SR:30000 FEC:3/4 SID:360 after a break ( PID:1128/1640 English - FTA). El Sharq is back on 11315.15MHz, pol.V SR:27500 FEC:5/6 SID:9506 after a break ( PID:1156/2156 - FTA). El Sharq is back on 11470.00MHz, pol.V SR:27500 FEC:5/6 SID:11 after a break ( PID:1101/1102 - FTA). El Sharq is back on 12594.00MHz, pol.V SR:27500 FEC:2/3 SID:4 after a break ( PID:2004/3004 - FTA). Nieuwe SID voor El Sharq op 11315.15MHz, pol.V: SID:9506 ( SR:27500 FEC:5/6 PID:1156/2156 Arabic - FTA). El Sharq is back on 11142.00MHz, pol.V SR:27500 FEC:3/4 SID:360 after a break ( PID:1128/1640 English - FTA). El Sharq (Egypt) is in DVB-S van start gegaan op 11315.15MHz, pol.V SR:27500 FEC:5/6 SID:9152 PID:1152/2152 Arabic - FTA. El Sharq is back on 11012.00MHz, pol.H SR:27500 FEC:5/6 SID:8022 after a break ( PID:1622/2622 - FTA). El Sharq is back on 12685.00MHz, pol.H SR:27500 FEC:5/6 SID:1430 after a break ( PID:1431/1432 - FTA). 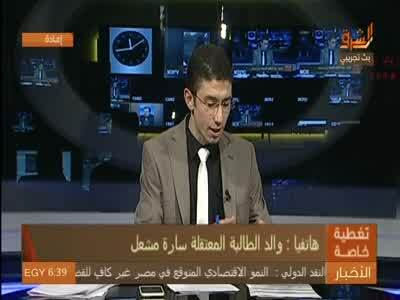 El Sharq (Egypt) is in DVB-S van start gegaan op 11012.00MHz, pol.H SR:27500 FEC:5/6 SID:8022 PID:1622/2622 - FTA. El Sharq (Egypt) is in DVB-S van start gegaan op 10815.00MHz, pol.H SR:27500 FEC:5/6 SID:17407 PID:2078/3078 Arabic - FTA. Nieuwe frequentie voor El Sharq: 11137.00MHz, pol.H (DVB-S SR:27500 FEC:5/6 SID:5 PID:517/1285 Arabic- FTA). El Sharq is back on 11012.00MHz, pol.H SR:27500 FEC:5/6 SID:8012 after a break ( PID:1812/2812 - FTA). El Sharq (Egypt) is in DVB-S van start gegaan op 12604.00MHz, pol.H SR:27500 FEC:5/6 SID:1330 PID:2030/3030 - FTA. El Sharq (Egypt) is in DVB-S van start gegaan op 11200.00MHz, pol.V SR:27500 FEC:5/6 SID:4718 PID:2018/3018 Arabic - FTA.